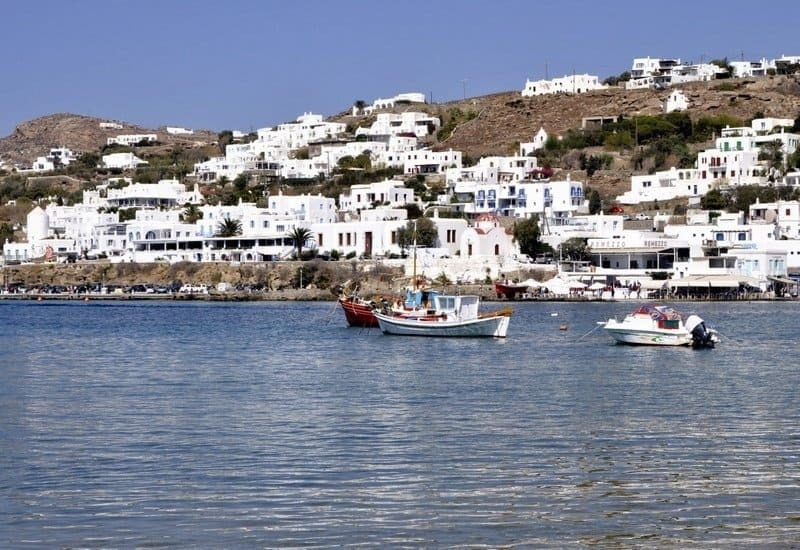 Mykonos is the epitome of Greek prettiness. 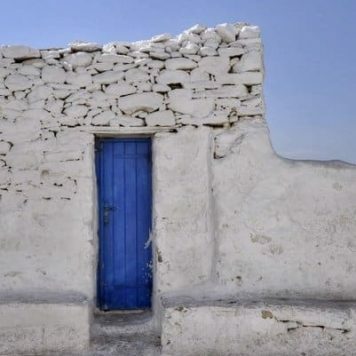 The island is part of the Cyclades archipelago, adjacent to tiny Delos in the Aegean Sea. Pristine white buildings with azure blue doors and windows are set against the bluest sky. 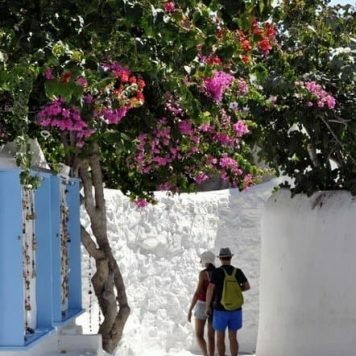 Winding alleyways lined with boutique shops, bars and restaurants festooned with fuschia pink Bougainvillea lead to tiny churches and heavenly courtyards. The sun shines and cats laze in doorways soaking up the heat. And then there are the iconic Mykonos windmills looking down over Chora (Mykonos Town), Little Venice and the clearest, bluest seas ever. 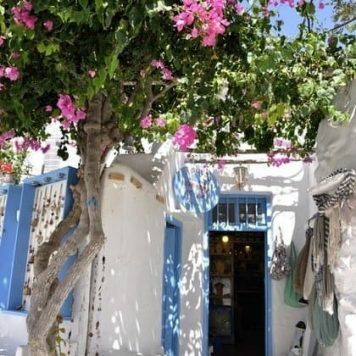 You’ll probably arrive into Chora by the harbour in the main area of town which has a little bay busy with restaurants, shops and little sugar-cube houses tumbling down the hillside. Colourful fishing boats bob around in the bay and Agios Nikolaos Church with its blue dome sits right by the water. You’d think it couldn’t get any prettier but, actually, it does. Head to the right and up the hill and you’ll soon see. 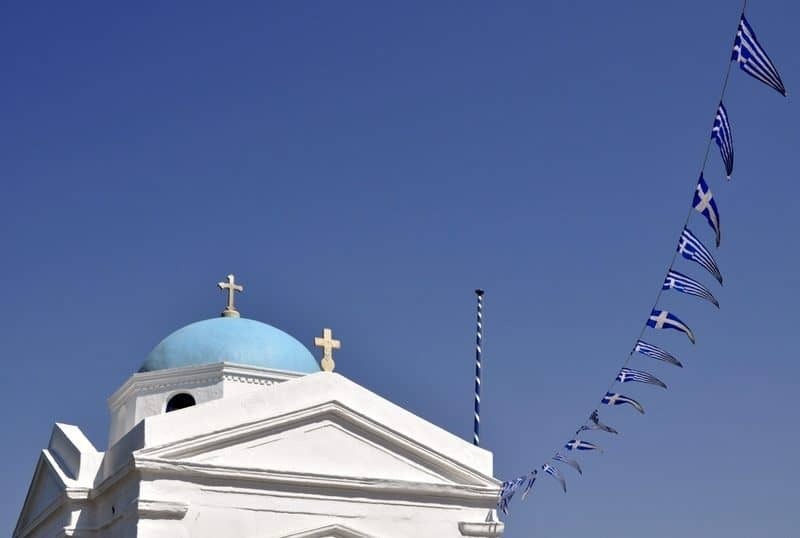 First you’ll come to the gorgeous Paraportiani Church, the most famous church of 400 on Mykonos. It’s a cute little pyramid-shaped building made up of a conglomeration of four churches built asymmetrically together. 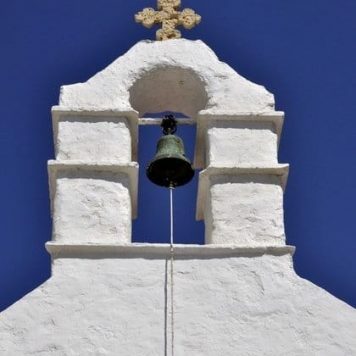 White-washed to within an inch of its life it has a little bell-tower, dome and is topped with crucifixes which stand out against the cloudless blue sky. There’s exploring and shopping to be done here in the tiny alleyways but first we’re going to visit the Mykonos windmills. Keep close to the waterside and you’ll pass through Little Venice. Bars and restaurants sit right next to the water, with little wooden balconies hanging over the sea. The crystal clear waves gently lap against the walls and it’s a lovely place to stop for a beer and from my shady little balcony the view over the water to the windmills was gorgeous. 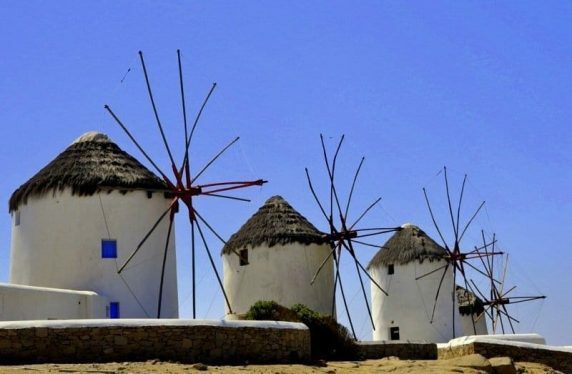 As you emerge from the slatted shadiness of Little Venice you can’t fail to spot the iconic Mykonos windmills (Kato Mili) standing sentry at the top of the hill. They’re old, built by the Venetians in the 16th century, for milling flour. They have wooden sails, white-washed walls and are capped with straw hats. One is now a museum and there are around a dozen on the island but these are the most famous and very photogenic! Feeling hungry? Then carry on to the top of the hill,past the windmills, through the car park and meander down to a quiet little bay and the golden sands of Megali Ammos beach. It’s a ten minute walk, sometimes with no pavement, but you’ll find a lovely, chilled restaurant on the beach. 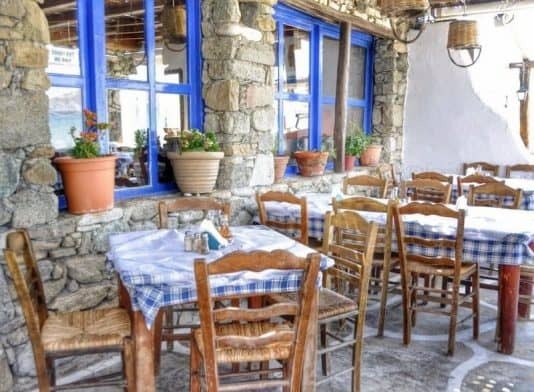 Joanna’s Niko’s Place Taverna. 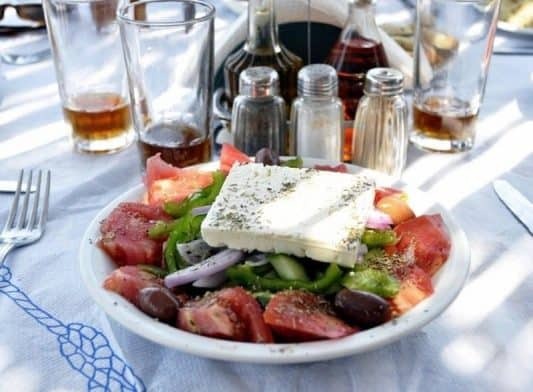 Recommended by Elle, from A Bird in the Hand, we stopped here for a fabulous lunch of fresh, crisp Greek salad, perfect in the heat, and little marinated fish which were full of flavour and deliciously tender. 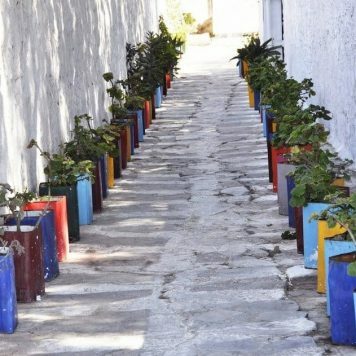 After a late lunch I had an hour or two to wander which really is the best way to get a feel for Mykonos Town. Art galleries, hip boutiques selling artisan jewellery, cute cafes and cobblestone alleyways were explored. I’d have loved to have seen those windmills as the sun set behind the hill but we’d sailed off into a crimson sunset long before the sky turned pink. Mykonos, I’ll be back. Many thanks to Celebrity Cruises for sending me on this fabulous cruise. All views, opinions and new-found love for Mykonos is, as always, entirely my own. 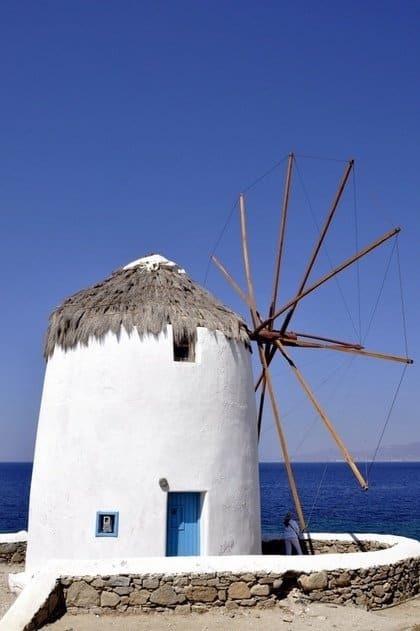 Those windmills are so iconic, I would love to visit Mykonos. Sounds like you had a wonderful cruise, Suzanne! 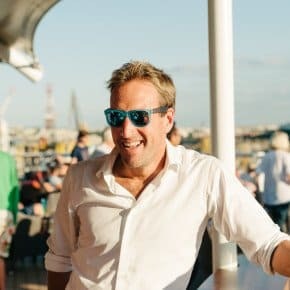 The cruise was fabulous and I loved our day in Mykonos so much that I planned a trip back to Greece – so I’m in Crete right now and it’s so lovely! Ohhhh so pretty!! 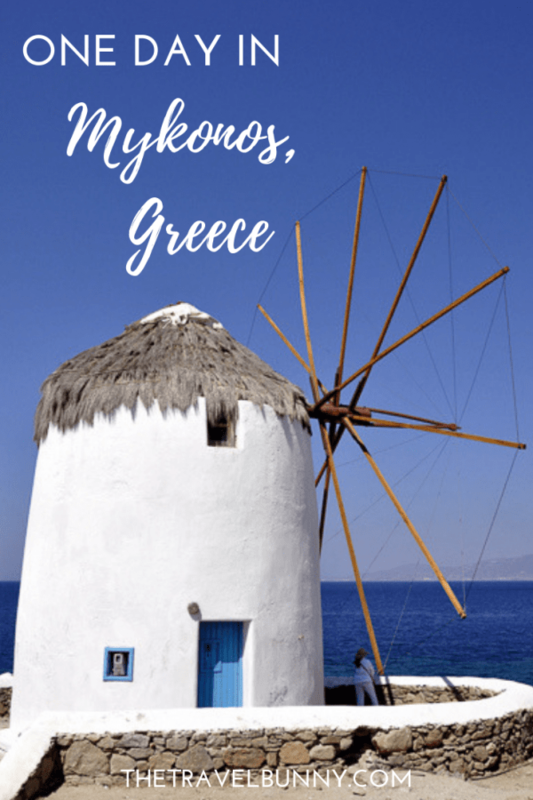 I am crazy to visit Mykonos and Santorini!! I hope it wont take long until I do! mykonos is a nice island but a bit touristy. 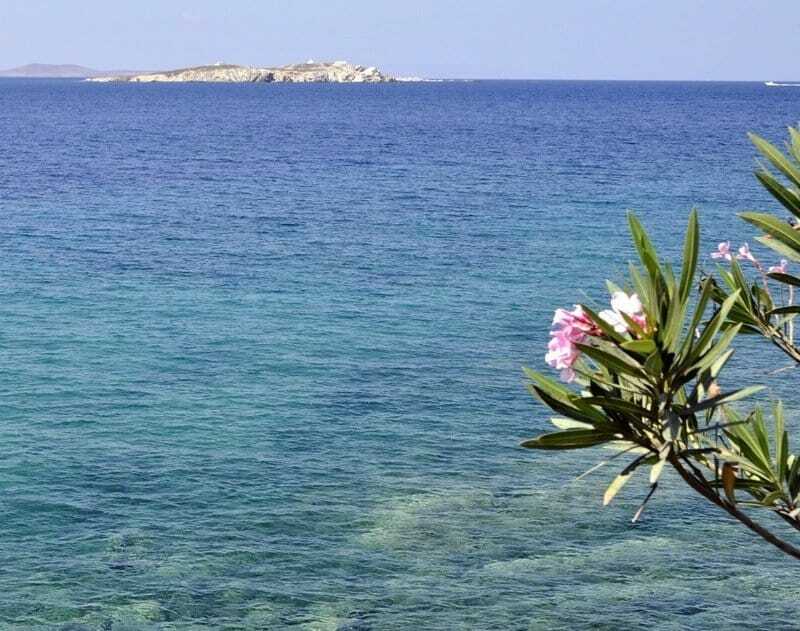 Let me recommend nearby Naxos and Paros instead! Did you get to Delos? 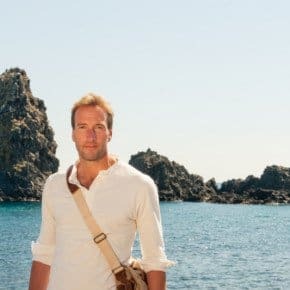 – that’s an interesting island and just half an hour on the boat from Mykonos. 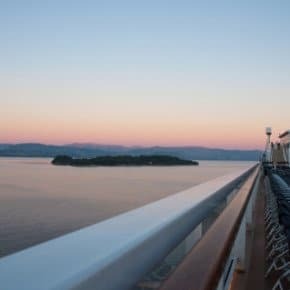 I’ll have to check out Naxos and Paros – I’d definitely like to soak up some Santorini sunsets. Having just got back from Santorini, Mykonos is next on my wish list. It looks beautiful and, as you say, very photogenic. The Paraportiani Church looks like it is made out of icing sugar. Delightful! Not sure why Comment Luv didn’t work the first time but here’s my first post from Oia on Santorini. It’s left me longing for more! Stunning photos Suzanne! The Greek islands are magical aren’t they? Have only been to Rhodes and Santorini. Crete is next on my list. Thank you Madhu – I’ve not been to Santorini, apparently the sunsets there are stunning. Rhodes is lovely – I’m fascinated by the Knights Templar history of the island. 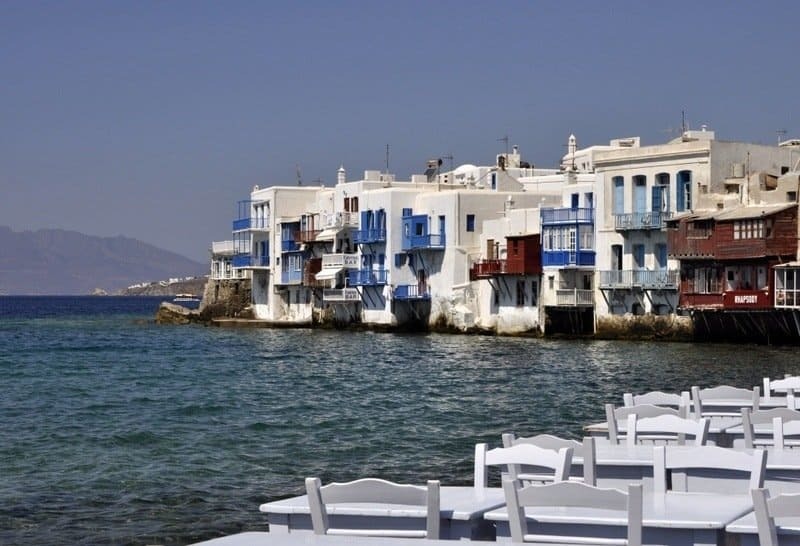 Mykonos looks amazing as do your images of it. I love all those of shades of blue. And all that lovely light. The light was so clear B and the island so photogenic. We really didn’t have enough time there, might have to re-visit some time. Ah, the memories! That Paraportiani Church! It had gone right out of my head till I saw it on here. We had a less successful visit, Suze. I think I managed to get us lost- heaven knows how, but we never managed Little Venice! But Little Venice is so close to that church Jo – so near yet so far away!! It’s gorgeous San – I need to go back! It was heavenly Shikha – I’d loved to have stayed longer. That Greek salad was sooo good! I’m falling back in love with Greece after a long break-up. 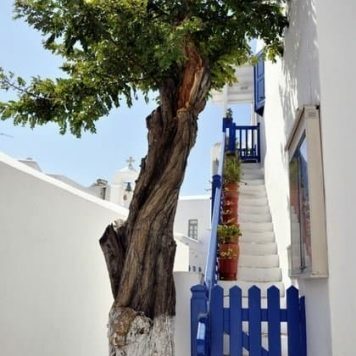 I’ve been to the Ionian islands twice, but never to the Cyclades. 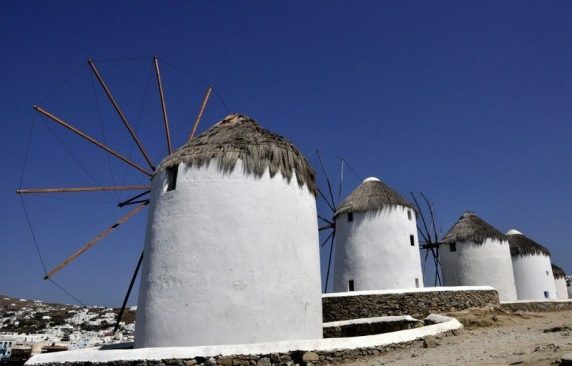 You’ve just put Mykonos and its windmills firmly on my 2015 shortlist! It’s been years since I was there – too many years! Mykonos looks gorgeous! 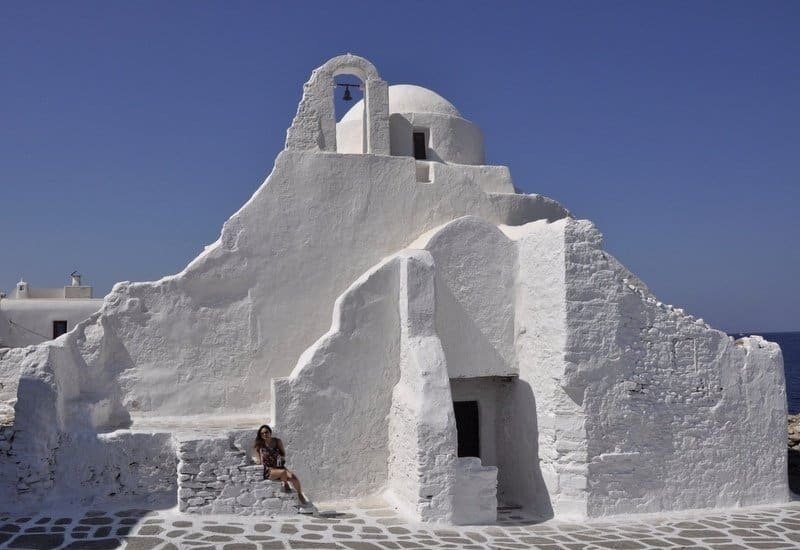 I’ve got a newly rediscovered love for Greek Islands after Santorini this summer and Mykonos looks like another one I’ll have to go and see for myself. Santorini’s on my list after seeing your pics! Went to a few Greek Islands in the 80s but never these two.